A steaming bowl of mashed potatoes with cream and butter is divine. A steaming bowl of mashed potatoes with cream, butter, cabbage, kale and carrots is sublime. Plus the bowl looks better with the kale and carrots. Cooked cabbage and mashed potatoes are roughly the same color - beige. The dark ribbons of kale and bright shredded carrots make for a much prettier dish, don't you think? I ate this colcannon happily as a meal for breakfast, lunch and dinner, but feel free to serve yours as a side with roast chicken or salmon. 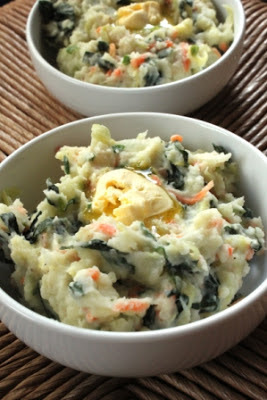 This is my riff on colcannon, the traditional Irish mixture of mashed potatoes and cooked cabbage. Kale and carrots add flavor, color and extra nutrients. Place the potatoes, whole and unpeeled, in a large pot. Cover the potatoes with cold water by a few inches and set the pot over high heat. When the water boils, turn the flame down, cover the pot, and simmer the potatoes until they are tender (a paring knife should go cleanly through to the center of the potatoes). The time will depend on how big the potatoes are, but start checking them after 30 minutes. Drain the cooked potatoes and let them cool until you can handle them. While the potatoes are cooking, melt the butter in another large pot over medium-high heat. Add the cabbage, kale and carrots. Cook until the vegetables are tender but not mushy, 10-15 minutes. Heat the cream and milk in a measuring cup in the microwave until warm.Slip the skins off the potatoes and put the potato flesh back in the pot. (Discard the skins.) Add the cream mixture and mash the potatoes with a hand-held potato masher. When they are fairly smooth, add the cabbage mixture and continue mashing to combine. Add salt and pepper to taste (you will need a good amount of salt). Serve immediately with an additional pat of butter on top. This is excellent! I always feel slightly guilty eating mashed potatoes because I know they are such a high concentration of starch. Putting the vegetables in, (especially the cabbage), sounds so good and healthy. Thanks! @Libbety - first of all, thank you for leaving so many comments on my blog posts. It makes me happy to see your name pop up! And second, totally agree with you about the vegetables easing the guilt of the mashed potatoes. I might just make some more of this tomorrow, because I just got home from a business trip and now I'm CRAVING it! I've made and liked colcannon the traditional way (I think mine had an onion too, or was that "bubble and squeak") but your additions of kale and carrot make it so appealing--yum! This was amazing! I can't say enough fabulous things about it! I was so excited to make this recipe that I rushed right past the cabbage and completely skipped it! This may have been a Freudian slip because my partner who grew up in Ireland can't say enough terrible things about cabbage..but the final version was amazing without it. I love the way the carrots tint the potatoes a beautiful pale orange color and contrast with the kale (I used black kale from Whole Foods). It was stunning and delicious - as well as being original and interesting - and a perfect warm comfort food fit with this January weather.